Amenorrhea, meaning the absence of your period, comes from three Latin words: a (no), men (moon), rrhea (flow). No moon flow. Our periods are susceptible to the influences of many things besides the moon so missing a period now and then is not a big deal. But if you are skipping periods and you are not pregnant, you will want to know why. Amenorrhea can be a signal of hormonal conditions that can have unhealthy effects on your body. Pregnancy is the most common cause of missing periods. On the other hand, some methods of pregnancy prevention also cause missed periods. Hormonal methods like birth control, pills, patches, injections, and certain IUDs can cause amenorrhea. Some women like this side-effect, some women don’t. It is important to note that this cause of light or absent monthly bleeding does not harm your body nor does it interfere with your future fertility or ability to have babies when you want to. Polycystic ovarian syndrome (PCOS) is caused by a continuous overproduction of the male hormone, testosterone. All women produce some testosterone, those with PCOS produce more. 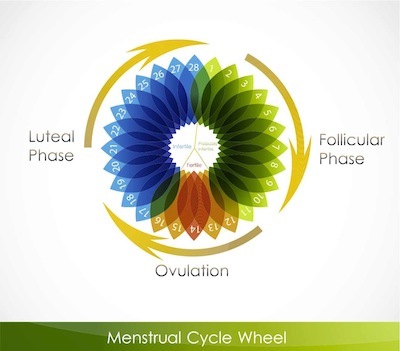 Women with PCOs usually have less than 6 to 8 periods per year. PCOs can be treated with birth control pills, unless the pregnancy is desired, in which case fertility medication may be needed. Functional hypothalamic amenorrhea (FHA) may be caused by excessive exercise, eating disorders, physical illnesses, mental health issues, or high stress. Under these conditions, the brain may think that it would not be a good time to have a baby. So the hypothalamus gland in the brain stops producing one of the hormones that operate the menstrual cycle. The production of too much prolactin, a hormone produced by the pituitary gland in the brain, can also mess with your menstrual cycle. This is often caused by a pituitary adenoma, a non-cancer tumor that is usually easily treated with medication. Other causes of too much prolactin are certain medications or a hypothyroid condition. Ashermann’s syndrome is caused by scarring within the uterus that interferes with menstrual blood flow. The scarring would only occur if you had previous infections within the uterus or heavy bleeding after childbirth that needed to be treated with a D&C (dilatation of the cervix and curettage [scrubbing] of the walls of the uterus). Menopause naturally occurs between the ages of 45 and 55. Primary ovarian insufficiency may cause the ovaries to stop producing or rarely produce eggs and reproductive hormones before the age of 40. Its cause is usually unknown but may be genetic. Hormonal therapy or infertility treatment may be needed.